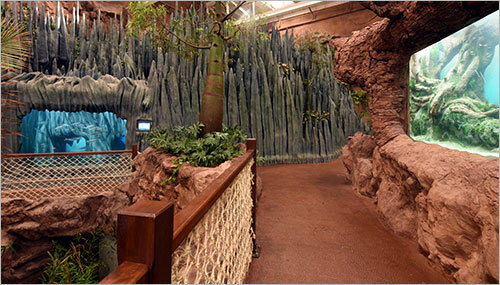 The Gran Canaria aquarium is a world class attraction that everyone must visit. It is located within a few minutes-walk from the cruise harbour in the Santa Catalina district, right in the heart of town (in Las Palmas). As you approach the big white building, it looks quite small. Don’t be fooled, there is plenty to see inside. A typical tour can take almost 2 hours, if you want to see everything, on all floors. Deep Sea Exhibition: Here you see large fish, like the bull shark, through the world’s largest curved methacrylate (36 meters long). There are plenty of facilities available to make your visit comfortable. The Gran Canaria aquarium is pram and wheelchair accessible. There are many toilets located throughout the attraction. There is a café located at the start of the deep-sea section, where you can buy sandwiches cakes and coffee. A unique attraction is the aquarium restaurant, Restaurante Nestor. 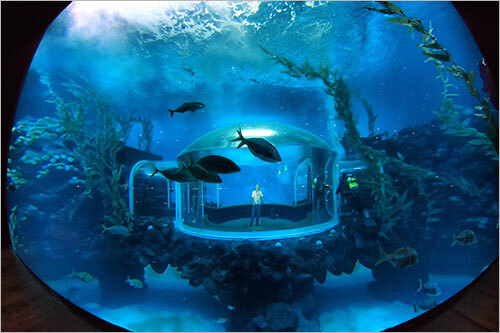 It has large windows to the main fish tank allowing you to watch the sharks and other fish swim past as you enjoy lunch. Main dishes on the al la carte menu cost around €10 or they offer a menu of the day for €19.90 for 3 courses, a drink and coffee. Details of the animals and fish are provided at each enclosure on LCD screens. These are not interactive, yet the information is displayed in Spanish, English and German. The staff are very friendly and most speak English and Spanish, and some are able to speak other languages including, French, German and Portuguese. A gift shop is located at the exit, here you can buy your gifts and souvenirs. There is also a second gift shop located inside the aquarium. This shop is in support of the Loro Parque Foundation (run by Las Palmas aquarium parent company). This charity is dedicated to protecting animals and preserving their habitat. Many of the profits from the Loro Parque group is reinvested in this initiative. 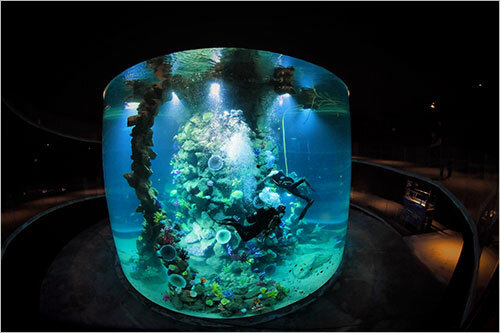 The aquarium is also dedicated to promoting clean living, with many videos throughout the attraction promoting the use of clean energy, recycling and warning against the illegal trafficking of animals. The Kiessling family, who are originally of German descent, but have spent so many years on the islands that they could be considered locals, are behind this project. They also manage Loro Parque and Siam Park, which are world-class theme parks, located in the neighbouring island of Tenerife. They are also constantly spreading the word about nature preservation projects, and have a foundation called “Loro Parque Foundation”. One of the projects is to help the loggerhead turtles to reproduce. The foundation also carries out other environmental awareness campaigns. By public bus: If you’re coming from the south of the island (Maspalomas, Playa del Ingles), then the bus you need to take is number 30, and head to north to the capital, Las Palmas. Just get off at the last stop, the Santa Catalina underground bus terminal. 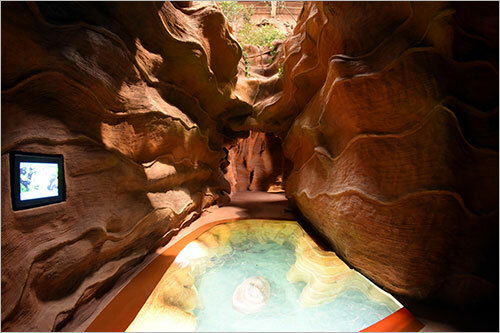 Come out, and you’ll be able to see the aquarium from there; it is around a 5-minute walk, once you come out. If you're coming from Puerto Rico, Amadores, or Mogán, you can come in the bus, which will leave you at the San Telmo bus station, and then take a taxi from there. You can also take yellow bus no. 12 from the top of the San Telmo bus station, and it will get you there within 10 minutes for 1.40 euros per person. Driving: Just get on the GC-1 motorway and head towards Las Palmas. Don't take any exit till you see the words "Santa Catalina". Walking: If you're at the cruise harbour, or are staying in the centre of Las Palmas, near Las Canteras beach, then the aquarium is just a short walk away. The staff working at the aquarium are well-trained and able to speak different languages, so if you get lost, or need assistance, you can call them. 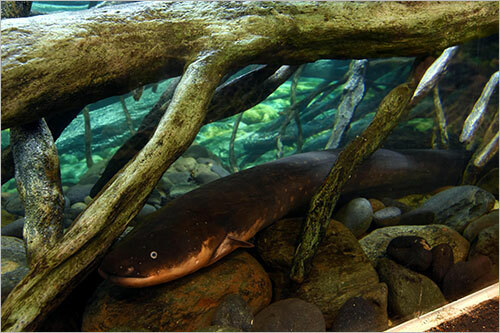 The aquarium is open every day from 9am to 6pm. Tickets cost €25 for adult general admission and €17.50 for child. For residents the tickets costs €18 for adult and €13 for child. Tickets can also be combined with admission to Loro Parque or Siam Park in Tenerife to make the final ticket cost cheaper. Take a light pullover or cardigan. The air-conditioning can be a little cooler compared to the outside temperature. Take a book with you. The large open spaces and calming atmosphere are perfect for a relaxing morning or afternoon. 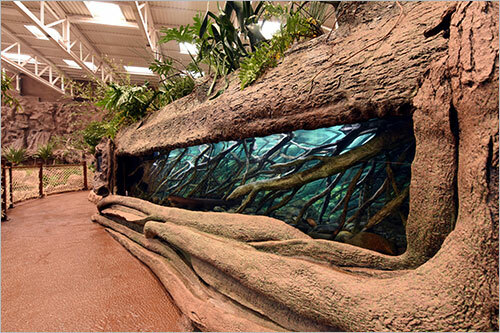 The Gran Canaria aquarium is a fantastic option for a rainy day as it is all undercover.